Some of you may remember the spirited club presence at Innsbrook back in 2015 when it hosted USAT club nationals that year. We want to bring back that fun group dynamic that was built in the weeks and months leading up to that race including special discounts on your entry fees partially subsidized by the club. This year, the club has picked that race: the New Town Triathlon. There are just 3 dates remaining. Discounts for the open water swim sessions are still available. Click here for the details. New Town Triathlon is part of both the Volunteer Series and the Hogan Club Challenge. Double points can be earned for both the kids tri and the adults tri in the volunteer series. Double points can also be earned for the adults tri in the club challenge. If you do take advantage of the race discount, we encourage you to volunteer your time at either the kids tri on July 7th or by helping out with set up or tear down post-race or packet pickup during the week leading up to the race. Email Mike Weiss at mike@bigshark.com to get on the volunteer list. 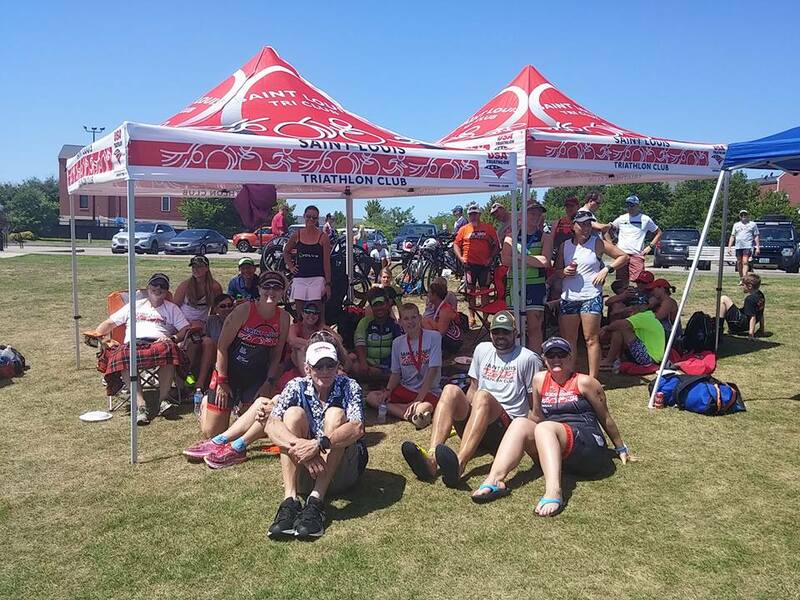 If that doesn’t work for your schedule, we encourage you to help out at these upcoming Big Shark events: Riverlands Rush Biathlon on June 10th, Tour de Kirkwood on July 22nd, or the Clayton Kids Triathlon on August 12th. 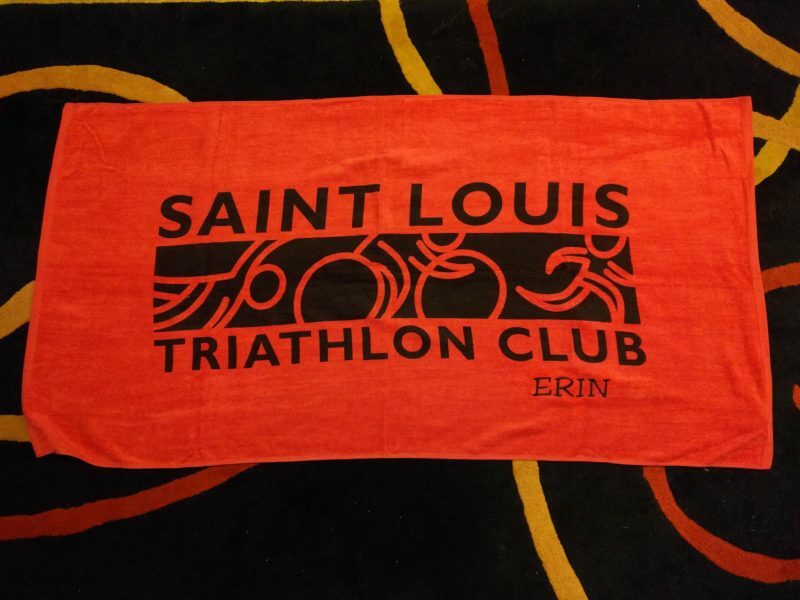 Everyone who participates in our Club Event race – either racing or volunteering – is entitled to one of these beautiful, large towels with the Club logo. Each towel measures approximately 60×30 inches. You also have an option to personalize your towel with an embroidered name or phrase. 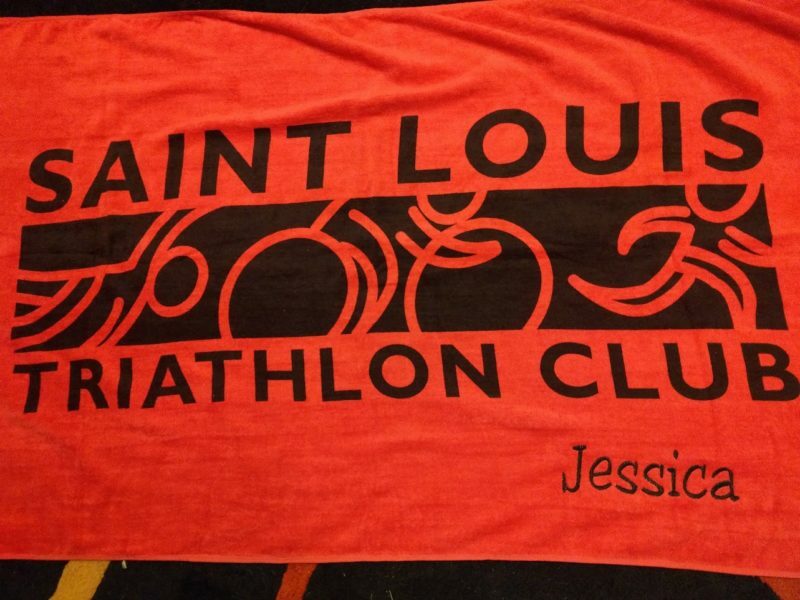 If you would like your towel customized, send an email to NewTownClubEvent@stlouistriclub.com and let us know what you would like embroidered. The text will be near the bottom right of the towel, similar to the samples provided below, embroidered by our extremely talented Club Secretary – Dianna Shank. Towels will be available to pickup at the picnic on June 23rd. After that, towels will be available both days at New Town, July 7 and 8. If you want to pickup your towel by July 7th or 8th, please get your order in by Thursday, July 5th. Anyone who wants a towel after the event and also would like it personalized can still do so, but it won’t be available to pickup until August. The club is partnering with the race director and awesome sponsor, Big Shark’s Mike Weiss, to offer club members a significant discount off your race entry. Use the discount code below to save 50% off the cost of your entry. This applies to all adult categories: short, long, and relay teams. If you are already registered for the race, please contact our treasurer JP Palmer at juliepalmer56@webster.edu and you will be sent a reimbursement to match the newly announced discount. Include a copy of your receipt, your full name and your home address. You will receive the reimbursement by check. It will be in a blank envelope marked bill paid, it’ll look like junk mail so don’t pitch it without looking in it first!